Rahul Dravid: 3 sixes in this series: Are we seeing Rahul Dravid 2.0? 3 sixes in this series: Are we seeing Rahul Dravid 2.0? Believe it or not, but Rahul Dravid has hit 3 sixes in this test series.Needless to say, this is something unexpected from someone who has hit only 15 sixes in 233 innings. Clearly, he has got this confidence from somewhere - may be IPL or may be from ODI exclusion. All the sixes hit were clean and safe. He played few shots in the air (even if it's a test match) which contradicts to what he is known to be doing throughout his career. But he knows that the stupid selectors want him to do it as a proof that he is still capable of playing ODIs. You are right. The selectors are STUPID,STUPID AND VERY STUPID. Vengsarkar, a stupid by nature as well as in his game, Srikanth, not so stupid but an over talkative who feels safe to drop Dravid but will never have the guts to drop Sachin, wants to be safe and goes with the tide. He is most definitely capable of playing ODIs as well as T20, its just that he needed a little bit of time to get into the mould. Now that he has played two seasons of T 20, can blast any bowling on his day, but his role can be quite an uniique one in T 20. No one gives credit to him, it never overpours. But for Sachin or Sourav, people seem to neverend their licking. It was hilarous to hear some people still talking about Ganguly's contribution in becoming No 1 team. I do not think Dhoni would even give a cent to Ganguly from heart for becoming No. 1.It can never be as the context today is different. Ganguly'scontribution was there but its over and done with 4 years back. But Rahul's is still on and on and on. Someone learned commented on TV today that it all started in 2001 when the ranking system started. It was Rahul Dravid then (with Laxman)in Eden, Rawalpindi, Adelaide, West Indies, England, Australia, Ahmedabad, Mumabi it never ends. 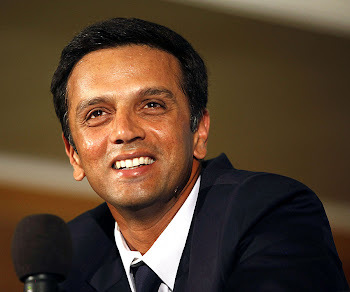 There has not been a single landmark in cricket since the time he started, that the success was achieved with Dravid. Its unbelievable,incomparable,invaluable . There is just no one like Rahul Dravid in the Indian side whether it is Sachin , Sehwag or anyone else. Apart from these two no one else can even come near him , anyway !! It's really frustrating to know that we will be seeing Rahul only a few times in the next year.BCCI wants those money making T20s and ODIs, so they have cut down the test matches.